A college level treatment of standard Calculus topics beginning with limits and ending with iterated (multivariable) integration. 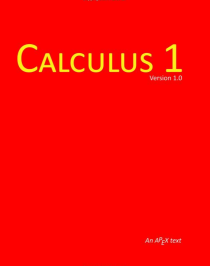 The material is presented in a "traditional format," designed to make the transition from popular Calculus books (such as Stewart or Thomas/Finney) straightforward. This text is suitable for most "Calc I," "Calc II" and "Calc III" courses. This text is currently in use in MA 123, 124 and 215, Calculus and Analytic Geometry I, II & III at Virginia Military Institute. The "Read" link above will download the full text. The "Order" link above is for the first of three volumes. Volume 2 and Volume 3 are also available for purchase. License: Creative Commons Attribution Sharealike Noncommercial. This license is very open. It allows reuse, remixing, and distribution, but prohibits commercial use and requires any remixes use the same license as the original. This limits where the content can be remixed into, but on the other hand ensures that no-one can remix the content then put the remix under a more restrictive license. The non-commercial clause can make getting printed copies of remixes challenging depending upon how strictly the authors interpret the clause. PDF. A Portable Document Format (PDF) file is can be opened using the free Acrobat Reader. It is not an editable format. Openness Comments: NOTE: The license is actually CC-NC (without the ShareAlike). I haven't updated the catalog to include that license yet, since almost no one uses it. The non-commercial license restricts some use, and the authors require contact by email to secure copies of the source files.